The Greater Columbus Arts Council joins hundreds of arts organizations and communities around the state and nation in celebrating National Arts & Humanities Month (NAHM) throughout October. Initiated in 1993 and coordinated by Americans for the Arts, NAHM is the largest annual celebration of the arts and humanities in the nation. From arts center open houses to mayoral proclamations to banners and media coverage, communities across the United States join together to recognize the importance of arts and culture in our daily lives. The month-long celebration will kick off this week on October 4 at the Ohio Statehouse with a reading of Governor John Kasich’s proclamation marking October as Arts and Humanities Month throughout Ohio, followed by a performance by acclaimed local bluegrass band, Grassahol. October 4: Grassahol & Kick Off Celebration. Presented by the Ohio Arts Council, the kick off in the Statehouse Atrium will be held from noon to 1 p.m. with a reading of Gov. Kasich's proclamation of October as Arts & Humanities Month throughout Ohio. Following the reading, high-energy bluegrass band Grassahol will perform a 45-minute set of their toe-tapping music. 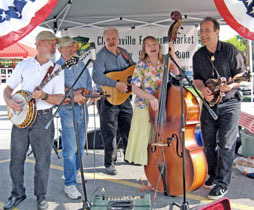 Grassahol has been described as "original, contemporary bluegrass at its finest" by Bluegrass Unlimited. Traveling throughout the Midwest featuring musical styling’s of Carl Yaffey (banjo), Chas Williams (fiddle), Heidi White (bass), Buren Carter (guitar) and Scott Brooks (mandolin). The lunchtime event will be free and open to the public. For listings of more events and info visit the Ohio Arts Council's Web site. October 6-9: The spotlight shines on Columbus as the Ohio Film + Music Festival celebrates some of the greatest talent from Ohio including never-before-screened short films by acclaimed filmmaker Jim Jarmusch featuring Tom Waits, performances by Columbus’ New Bomb Turks, RJD2 and rapper Envelope and many more musicians and filmmakers from across the state. Click here for more details about the weekend Festival. October 14: A Celebration of Poetry, emcee for the evening will be Chiquita Mullins Lee and presented by the Ohio Arts Council. Ohio poets Wendy McVicker and Andy Roberts will read their original poetry, and Ohio Poetry Out Loud champion, Caira Lee from Shaker Heights High School will perform selections from the Poetry Out Loud anthology as well as her own compositions. The free lunch-hour poetry reading event will be held from noon to 1 p.m. at the OAC's Riffe Gallery, located at 77 S. High St. in downtown Columbus. Contact the Riffe Gallery at 614-644-9624 or 614-728-4475 for more details. October 16: So You Want to Make Music in Columbus? a free presentation by Jazz Arts Group and Columbus Music Co-op Workshops for Musicians. Get tips and other useful advice from the Columbus Music Co-op such as, How do you book shows? How do you make a press packet? How much does a sound guy cost? The Columbus Music Co-op answers these questions and more in a workshop for aspiring musicians. The conversation will be held from 2-4 p.m. at the Jazz Academy, located at 771 East Long Street, 43203. Space is limited so please register in advance. The Columbus Music Co-op is a community organization that advocates for musicians and music in Columbus through grants, workshops, networking and community events. For more information about CMC, please visit columbusmusiccoop.org. Click here for event details. For more listings of other Jazz Art Group events happening in October, click here. Through October 21: Strands, a collaborative presentation from CAW! (Creative Arts of Women). The show features visual and performance art about hair, filaments and fiber, DNA and other "strands." The contemporary concept is presented by the Columbus Metropolitan Library featured in the Carnegie Gallery, 96 South Grant Avenue, 43215. All proceeds of this exhibit benefit the Hair Theater Fund. Click here for more info or contact the Columbus Public Library at 614-645-2275. October 20-21: In celebration of the upcoming Bicentennial of the City of Columbus, The King Arts Complex presents Legends & Legacies: Celebrating Our Own. The program recognizes the rich and diverse contributions of Americans by paying tribute to local, regional and national individuals who have shown their commitment to freedom through their efforts in social justice, human rights, cultural democracy, artistic excellence and service. The King Arts Complex will celebrate their 24th anniversary by celebrationg 24 of Columbus' own including Archie Griffin, Larry James, Kojo Kamau, Doug Kridler, Wayne Lawson, Aminah Robinson and many more. A VIP Reception in the Nicholson Auditorium will immediately follow the Awards Ceremony. Tickets for the awardsceremony & VIP Reception are $100 and tickets for awards ceremony only are $50. For more information contact us at 614-645-5464 or visit www.kingartscomplex.com. October 27: CAPA will present Ballet Maribor's Radio & Juliet, choreographed by Edward Clug this adaptation of a popular romance/tragedy is boldly expressed against the epic work of alternative rock band Radiohead. The dance ensemble interprets the delicacy of love with the cold hand of mechanization in the modern world. Radiohead's music coupled with the expressive mix of Ballet Maribor's signature minimalist forms create an experiene that dance and music lovers won't want forget. Click here for more information about the performance. For details about other CAPA events happening in October, click here.